My husband’s step-brother moved into his college dorm last week, so of course he needed what all guys think of when they move…a refrigerator. We had a mini-fridge in our garage that we were using for beverages, so we loaned it to him. Since we had to take everything out of the fridge I had an influx of beer in my kitchen refrigerator taking up valuable food (and wine) space. I had an ah-ha moment…Since I won’t drink a six pack within the next month I need to cook with it…and that is where this recipe came from. I will admit it, I do enjoy a good beer. My favorite one is New Castle Brown Ale, it has such an earthy flavor and is not super heavy. 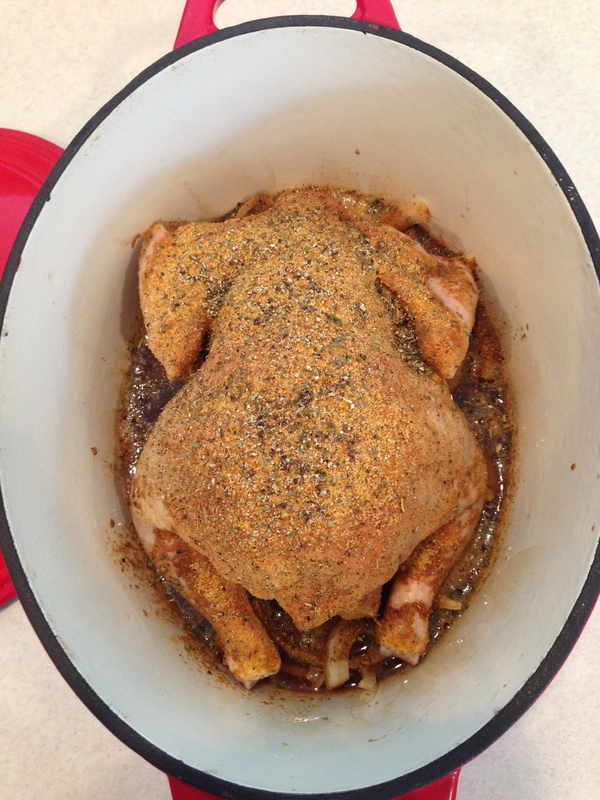 I also love baked chicken, so moist and delicious….mmmm now I am ready for lunch! Here is a recipe for a wonderful chicken, that is simple to make, and has an unique and hearty flavor. Place the onion in the bottom of your baking dish and then take the giblets out of the chicken and rinse him off in the sink. Set the chicken breast down on top of the onions and pour the New Castle all over and around the chicken. Sprinkle all the seasonings on the chicken, cover and bake at 350 for about an hour or until a thermometer reads 165 in him. Once the chicken is done, take it out of the dish and place on a cutting board to carve and serve. Cooking the chicken with the breast down makes the breast meat really juicy and flavorful. I serve this with green beans, sweet potatoes and rolls.